Judicial system needs meaningful reforms, says Deputy Foreign Minister, who will get his boss back. MK Ze'ev Elkin (Likud) voiced his satisfaction Wednesday with the court verdict acquitting MK Avigdor Lieberman of all charges against him. Lieberman will return to his former position as Foreign Minister. The post remained empty since he vacated it last year, for him to return to if and when he is acquitted. Elkin functioned as acting foreign minister. Elkin said Wednesday that the Foreign Ministry "requires a full time minister and full time deputy minister. It was not an easy period, when I had to carry out one full job as well as part of the other job. We will now return to regular and normal actiuvity." Elkin said that his relations with Lieberman are good. 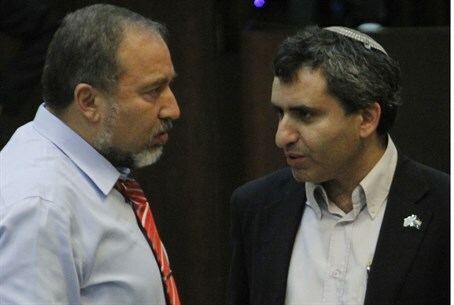 The verdict proves the need for reforms in Israel's legal system, Elkin added. "It is no secret that I, along with MK Yariv Levin, have been talking about this need, and what happened today is additional proof that we are right, and that there is a need to separate the powers of the Attorney General and the government itself, and a need for supervision over the State Attorney's Office.